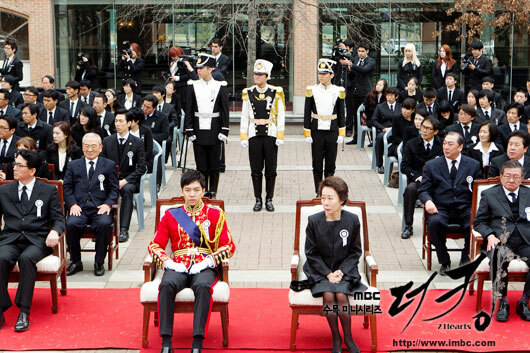 The behind the scene story for the filming of Imperial Jade Seal handover ceremony and funeral ceremony in MBC drama The King 2 Hearts was made public. 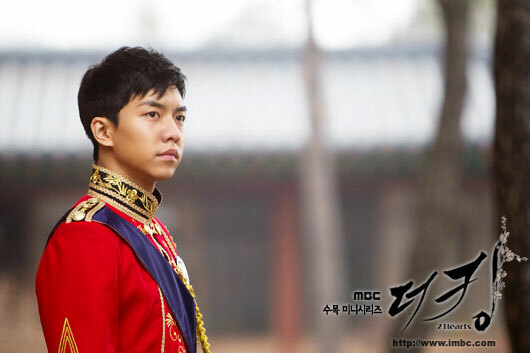 In the episode 8 of The King 2 Hearts broadcast on April 12th, 2012, after the death of Lee Jae Kang (Lee Sung Min), Lee Jae Ha (Lee Seung Gi) inherited the throne, and the drama aired the ceremony of acceptance of the symbol of the throne – Imperial Jade Seal, and funeral service for the King. The sereious and solemn atmosphere during the ceremony was created after attention efforts of production team. The filming crews pulled out all the stops to reflect the grief scene on the death of the King. In the Imperial Jade Seal handover ceremony, after Lee Seung Gi opened the door to accept the Imperial Jade Seal and opened the door, over 20 royal guards of honor and over 30 administration officials including the chief secretary stood on both sides and bowed. 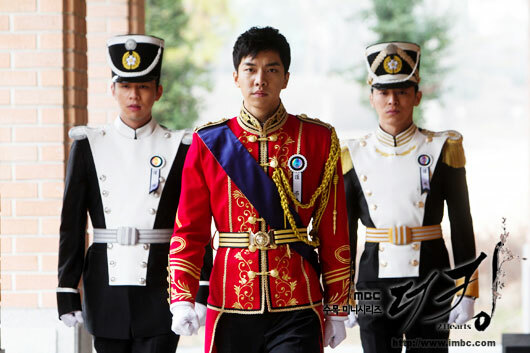 After Lee Seung Gi accepted the seal, over 20 royal guards of honor worshiped on bended knee, and then stood up to salute together. Over 20 persons performed the movement at the same time tidily, there was some difficulties in coordinating the action. 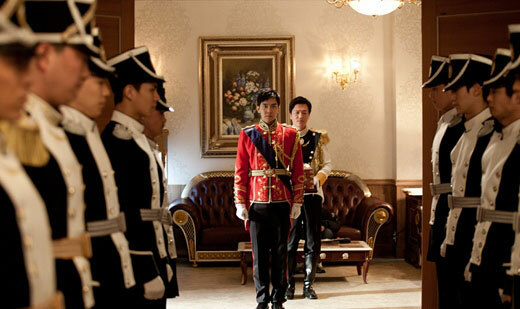 Eventually after repeated practices by over 20 royal guards of honor, the scene was completed successfully. The scene was the proposal of Lee Sung Jae after close observation, thus a different version was filmed. 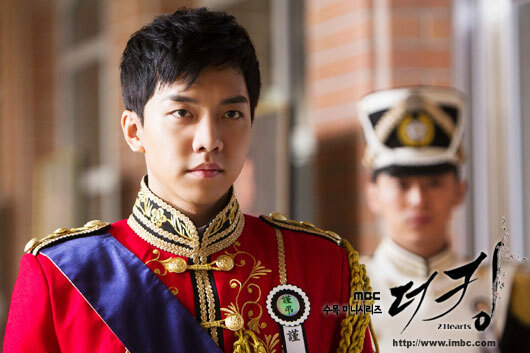 The original setting was that Lee Seung Gi directly holding the Imperial Jade Seal, but Lee Sung Jae thought that at the moment, Lee Seung Gi was not yet the King. Therefore, in the end, the shooting was for receiving the Imperial Jade Seal, and then holding the seal to ascend the throne as the King. 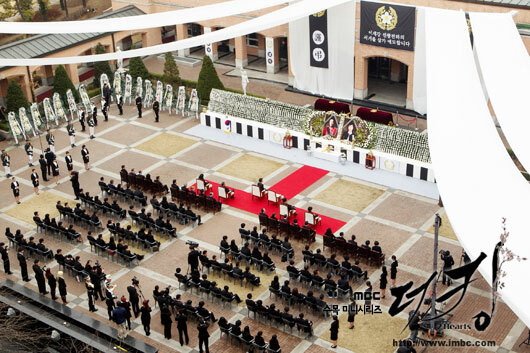 In the King's funeral ceremony, the scene reproduced extra large portrait, funeral ceremony wreaths hanging with thousands of white chrysanthemum, hundreds of garlands and other actual funeral events. 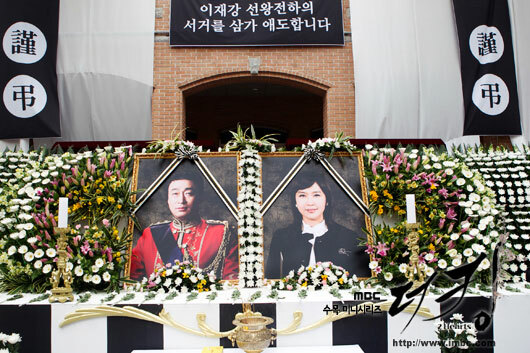 Over 400 extras were participating in the filming of the funeral service, which was shot for 9 hours. 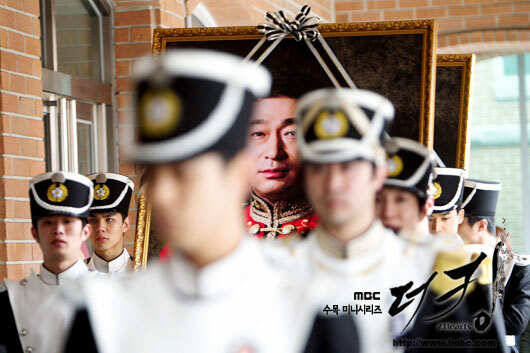 Even though the duration of funeral service in the broadcast is not long, but production team devoted strenuous efforts, displaying the fineness of the crew members. Producer Kim Jong Hak Production said, "Lee Seung Gi perfectly expressed the burden of suddenly inherited the throne and anxiety of couldn't cried in front of his citizens. Production team has been meticulous in the ceremony scene, carefully asked in detail and made full preparation. They completed the mourning scene with passion and enthusiasm."